Hot, doughy waffles are a treat usually saved for Sunday brunch due to the time they take to cook. However, if you want to eat waffles when you're short on time, give the frozen variety a try. These days, frozen waffles come in numerous different styles and flavors, including Belgium, home-style, blueberry, flax and whole-grain. Frozen waffles are a cinch to cook in the oven. Place the waffles in a single layer on a baking sheet. Make sure that there is space around each waffle so that they are able to cook evenly. Put the baking sheet into the oven and cook for five to eight minutes, depending on the variety of waffles that you are using. Thicker waffles, or Belgium waffles, will take longer to cook than home-style. You do not have to turn the waffles during the cooking process. Remove the waffles from the oven when they are finished cooking. The waffles should be hot and golden brown in color. Serve immediately. Buy whole-wheat or whole-grain frozen waffles to add fiber, vitamins and minerals to your breakfast. Try eating your waffles topped with butter, maple syrup and fresh berries. Have eggs on the side for a well-balanced meal. 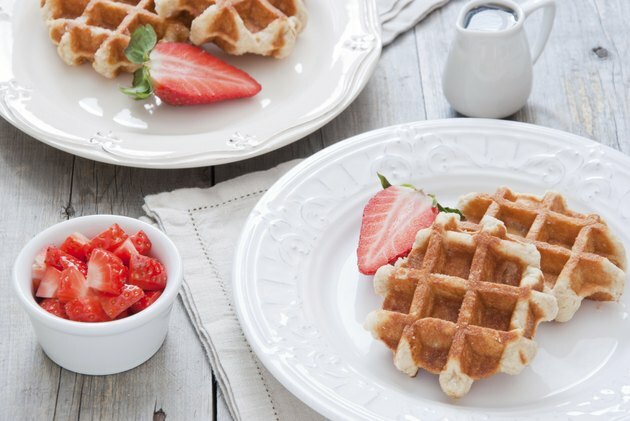 Top waffles with your favorite cheese and enjoy them for lunch as an alternative to a sandwich. Spread creamy peanut butter on top of a hot waffle for a mid-afternoon snack. Smother a piping hot waffle with fresh whipped cream and drizzle with chocolate sauce for a dessert.